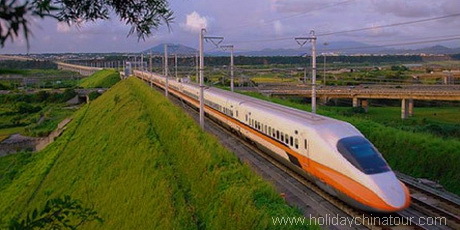 Holiday China Tour specializes China train travel service for individual or small group travelers to save time and money. Holiday China Tour offers various travel options with reliable service to major China tour destinations. China train tour packages offered by Holiday China Tour will enable you enjoy the most cheapest, safest and exotic way of train travel in China. Visit Great Wall, Ming Tombs, Forbidden City, Temple of Heaven, Summer Palace, Panda house, Lama Temple and Hutong Tour in Beijing. Visit Banpo Museum, Big Wild Goose Pagoda & Terracotta Warriors and many other historical and cultural city attractions in Xian. Budget train tour 5 days Beijing and Guilin include sightseeing Tiananmen Square, Ming tombs and excursion to the Great Wall in Beijing and the most beautiful natural sceneries in Guilin, including Li River, Yangshuo and Longji rice terraces. Beijing and Shanghai are two of the top China tour destinations. This tour is designed for you to enjoy the essence of two cities, including the historical, natural and cultural attractions in Beijing and Shanghai, including, the Forbidden City, Great Wall, Yu Garden, the Bund, and experience of China bullet train travel, etc. Golden triangle China train tour, the best way to save your money on flight and enjoy the valued China train travel experience. You may experience new express trains in this 9 Days China Train Tour Beijing, Xian and Shanghai! 9 Days China Train Tour to Beijing, Guilin and Shanghai is the best experience to see the highlights of China and join-in China tours covering major attractions in Beijing, Guilin and Shanghai. Chinn train travel to Tibet could be a wonderfull experience of traveling in China. You will enjoy the wonderful landscape and unique high platuo views along the train journey in the western China. Train Travel could be the cheapest and very convenience way to travel in the eastern China. China Train Tours offered by Holiday China Tour could be your unforgettable travel experience to Hangzhou, Suzhou, Wuxi, Zhenjiang, Nantong, Shanghai and Nanjing. Holiday China Tour offers Yunnan train travels from Kunming to Dali and Lijiang. Yunnan train tour packages lead you to enjoy the fabulous natural scenery in Yunnan at best prices. We can also customize your Yunnan train travel routes to other major cities of China.